Passengers on flights arriving at Frankfurt Airport – and particularly those onboard flights approaching from the east to the airport’s new Runway 25R, which is used only for landings – might well be startled into thinking they have just seen the world’s largest cruise ship docked next to Germany’s largest airport. They haven’t. But the unique appearance of The Squaire – which, with a total floor area of 1.5 million square feet (140,000 square meters), is reputedly the largest office building in Germany – could easily fool any aircraft passenger casually glancing out of a left-side window moments before landing on Runway 25R into wondering what a behemoth ocean liner is doing at an airport. Shaped nothing like its name, The Squaire is a huge, 10-floor ‘groundscraper’ extending two-thirds of a kilometer in an east-west direction along the axis of and directly above the railway lines that run through the Frankfurt Airport Fernbahnhof (inter-city rail station). 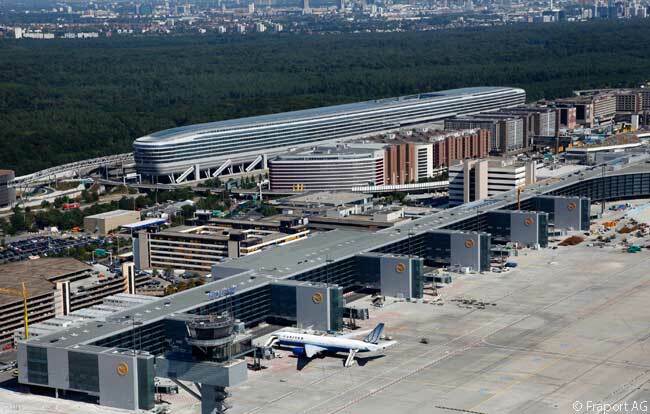 Frankfurt Airport’s rail station gets 190 long-distance trains a day and existed well before The Squaire was built. So instead of closing the rail station, re-routing the train tracks and starting at ground level, it was easier to build The Squaire above the station. In its entirety, The Squaire does not touch the ground. It is suspended over the railway station and tracks by 86 enormous, angled-and-paired pillars which bear its colossal weight. Fully 660 meters (2,165 feet) long, 65 meters (213 feet) wide and 45 meters (148 feet) high, The Squaire literally is shaped like a vast ship that is twice the length of the Eiffel Tower. It has a forward section that gradually tapers to a curved bow at its western end and a blunt, slightly curved stern at its eastern end. About two-thirds of the length of the building back from its ‘bow’, a wide, covered-over bridge crosses the autobahn which runs parallel to and a few yards south of the train tracks. 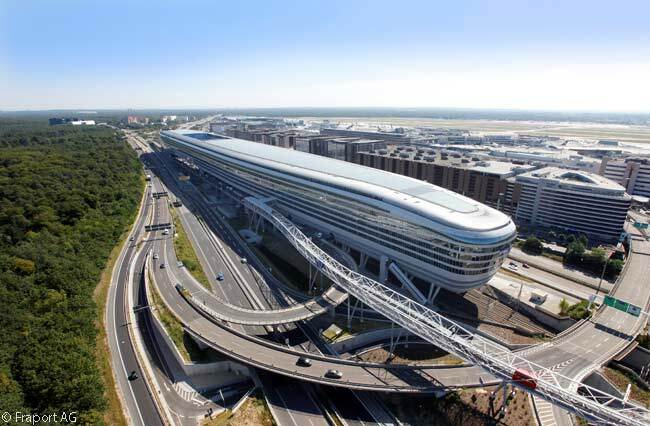 This bridge connects The Squaire to the Frankfurt Airport Center office building directly to the south of the autobahn and from there a narrower covered bridge conveys foot traffic over the terminal access road to Frankfurt Airport’s Terminal 1. The wide bridge connecting The Squaire to the Frankfurt Airport Center across the autobahn is far more than just a footbridge. When you are crossing it, you have no idea you are on a bridge: it is entirely covered over and contains shops and offices. 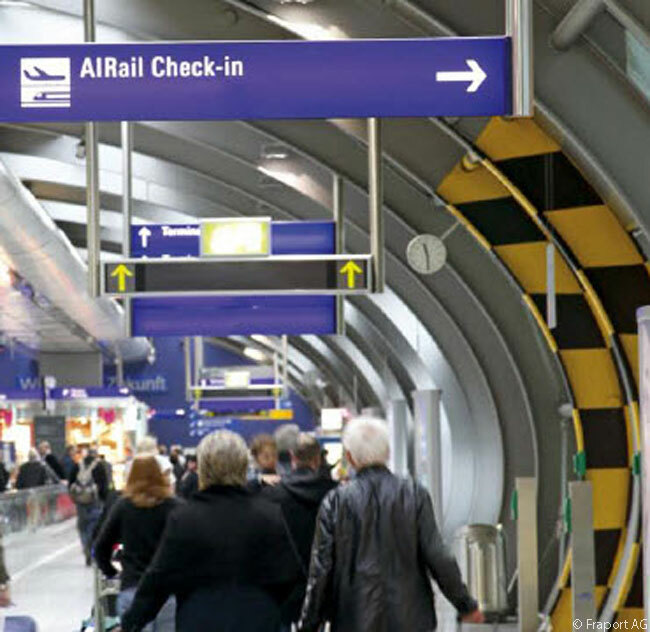 More important – and a welcome sight for all passengers arriving on long-distance trains, as well as for guests at either of the two hotels in the Hilton Frankfurt Airport “cluster” – is the AIRail Terminal, located on or just south of the wide footbridge. Here, many airlines’ passengers can check in for their flights – and, crucially, they can check in their bags. This relieves them of the effort of pulling heavy cases or wheeling baggage carts throughout the remainder of the walk to Terminal 1 or the bus-stop or the SkyLine train station for Terminal 2. As someone who nowadays has some difficulty walking, I can testify that the trek with a very heavy suitcase and flight bag along the passenger bridges between Terminal 1 and The Squaire can feel uncomfortably long. I used the AIRail Terminal several times. For a list of all the airlines whose passengers can check in for their flights at the AIRail terminal, see www.frankfurt-airport.com/content/frankfurt_airport/en/checkin_luggage/check-in/at_the_airail_terminal.html. The part of The Squaire adjacent to the wide covered bridge crossing the autobahn contains a wide plaza about the size of a football field (or perhaps a bit larger). 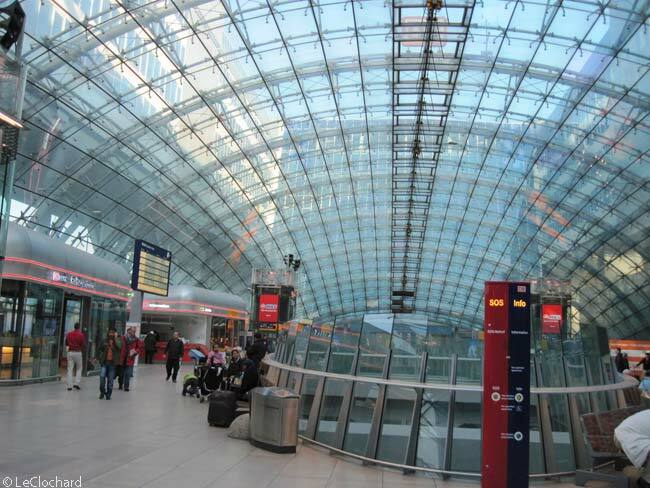 This plaza, which forms the main entrance to the glass-roofed Frankfurt Airport Fernbahnhof, has at least three levels. At the eastern and western ends of the plaza, other escalators connect the main level to a higher plaza level. This looks on to the open space of the plaza (which is also ringed by shops, restaurants and Deutsche Bahn ticketing and information centers) from both ends of the building. At the western end of the plaza, escalators also connect the main level to a lower level which boasts bars, restaurants and shops. 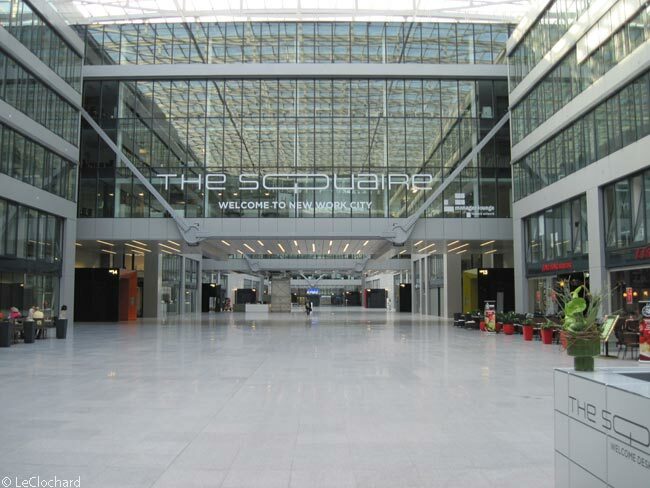 Apart from an up-market burger restaurant, the entire eastern end of The Squaire’s upper-level plaza is given over to what Hilton Worldwide calls its “Frankfurt Airport Cluster”, the ground floor of which is actually on the fifth floor of the 10-floor groundscraper. The Hilton cluster’s guestroom floors run from the sixth to 10th floors of The Squaire, at its eastern end. 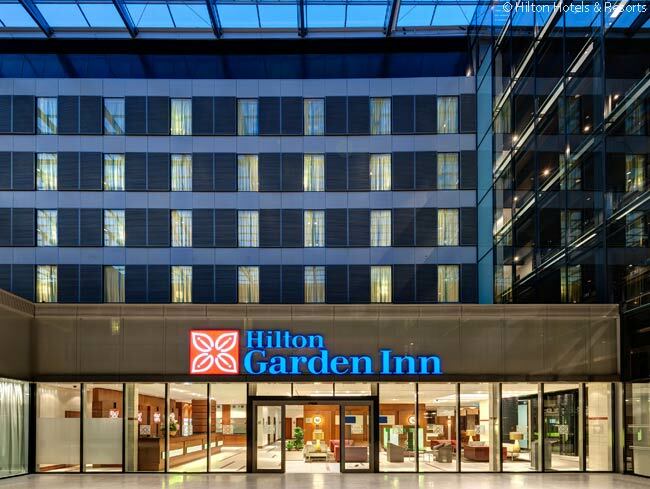 Lining both the northern and southern sides of the eastern upper plaza are the guestroom floors of the Hilton Garden Inn Frankfurt Airport. This is a comfortable, 334-room hotel priced and fitted out to suit the needs of families and business or leisure travelers using Frankfurt Airport. These guests are usually staying over for one or more nights in order to make connections between flights or (probably more often) between flights and long-distance train services linking other parts of Germany with Frankfurt Airport. However, guests at the Hilton Garden Inn can also, just as easily, be tourists exploring the Hesse region of Germany in which Frankfurt lies or businesspeople visiting the Frankfurt Rhine-Main Metropolitan Region – which, with a population of 5.6 million, is Germany’s second-largest urban region. The exact geographical center of the European Union is only about 25 miles east of Frankfurt. The Hilton Garden Inn is an ideal base for either type of visitor. 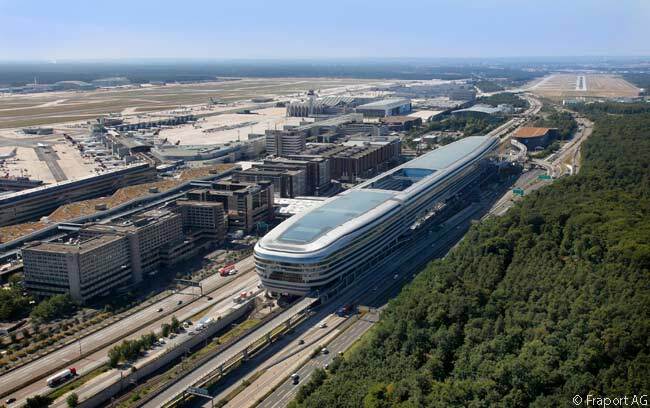 It is located less than 100 meters (328 feet) from Frankfurt Airport’s long-distance and regional railway stations – the center of Frankfurt is only 15 minutes away by train – and only about 500 meters (550 yards) from Frankfurt Airport’s Terminal 1. This is the terminal to and from which almost all Lufthansa flights operate.